The National Security Inspectorate’s (NSI) annual Summit gathered over 250 approved company representatives and key industry stakeholders on 21st March at the Vox in Birmingham. 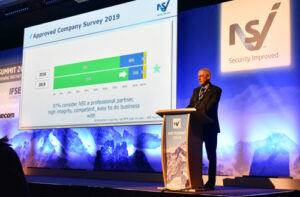 The event was supported by IFSEC and attended by senior representatives from the SIA, NPCC, the NFCC and other key industry bodies. Over 25 speakers covered a range of subjects including the industry perspective on the ECHO automated call handling project, a variety of updates on standards, new approvals, the SIA’s new Approved Contractor Scheme assessment, the management of unwanted fire signals and document awareness.